There’s a new form of engagement tool out there – one which activity encourages real-time discussion between employees in order to fully improve your HRIS management. Enter employee listening technology – the collective brain child of researcher and global LinkedIn influencer Michael Silverman. HR Tech News caught up with Michael and spoke to him on his most recent infographic – copied below – which categorizes the benefits and drawbacks of listening technology. “Essentially, what I was trying to do, was isolate a space in the market that I work in, narrowing it down to tools which allow employees to give their own opinions on their organizations,” explained Michael, “It’s not about crunching HR data into HR systems to hit some demographics. Rather, it focuses on workers giving their feedback on the businesses they’re in, in order to improve day-to-day functions. 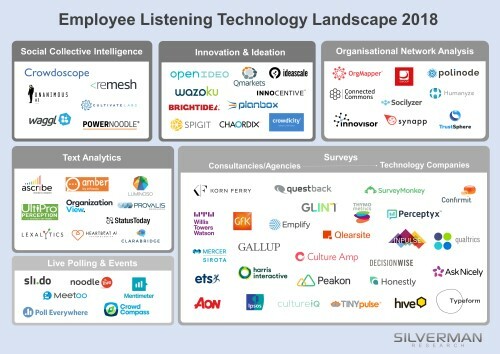 Each of these categories contain a variety of companies which offer employee listening technology, in one form or another. Michael’s main aim in organization these businesses was to showcase the variety out there. “One of the main things that annoys me about some engagement tools is that they simply push surveys out. In reality, unless you’re giving people a say in an open forum, you cannot really class it as employee voice tech. The tools in that space are all incredibly diverse. There are new takes on polling which encourage interactivity between participants in a real-time forum. In a lot of surveys, HR looks at the data collected, aggregates it and then has to interpret it themselves. That alone gives rise to incorrect assumptions and even bias. Whilst it’s HR leaders’ jobs to analyse the data that comes in from staff interaction surveys, it’s essential to use tools which eliminate and discrimination as much as is possible. By aggregating employee data via 360-degree listening technology – could HR leaders have finally hit upon the key to solving the global engagement puzzle? Have your say in our comment section below.